Conrad1 Riehle was born November 24, 1828* in Wagshurst, Baden, Germany1,2, and died August 06, 1881 in Spillville, Winneshiek County, Iowa3. He married Anna Jarosh September 24, 1856 in a Pioneer wedding at an undetermined location4. She was born March 11, 1837 in Tabor, Bohemia Czech Republic)5,6, and died March 30, 1914 in Spillville, Winneshiek County, Iowa7. Note: There is a discrepancy with Conrad Riehle’s birth date. The Wagshurst Catholic Church records list: Konrad Riehle, child of Felix Riehle and his wife Helena Eckstein, born and baptized on 24 November 1828. However, the birth date listed on Conrad Riehle’s tombstone in St. Clement’s Cemetery in Winneshiek County, Iowa is 25 November 1827. The evidence we have gathered to date confirms that Conrad Riehle is the son of Felix Riehle, so we have come to the conclusion that the birth date listed on the tombstone is wrong. Conrad emigrated from Wagshurst, Baden, Germany with his parents and siblings in 1847. The Felix Riehle Family settled in Ripley County, Indiana. In 1848, settlers from nearby Oldenburg, Indiana made an exploratory trip to the frontier of Northeastern Iowa. These settlers came back with glowing reports of the Iowa frontier. Conrad Riehle and his neighbor George Herzog, both young unmarried men, moved to Iowa in 1850. On the 1850 Federal Census, Conrad Riehle lived with George Bachel family in Jackson Township in Winneshiek County, Iowa along with Ferdalin Baumgardener. Conrad later settled in the Calmar Township (south west corner of Winneshiek County) Iowa. He was one of three settlers that had a team of horses in 1851; most settlers used oxen, which were much cheaper. Conrad Riehle was a farmer, grew wheat, oats and corn. The Federal Census from 1860 – 1880 shows that farming continued well; that Conrad’s sons were progressive farmers; that their crops were good; that Conrad prospered. Two separate citations mention that Conrad drove a two-seated surrey to church with great enthusiasm. Conrad and other German-speaking settlers helped to construct the first permanent church in Spillville, Iowa. It was made of brick and named St. Clement. Construction began in 1856. Conrad Riehle and Anna Jarosh’s marriage is listed in a pioneer roster of the Catholic clergy before a resident pastor was assigned to Spillville. They were married on September 24, 1856. She was of Czech decent, he was German. 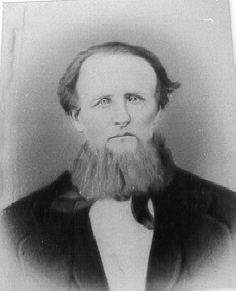 Conrad’s portrait hangs in the Bily Brothers’ Museum in Spillville, Iowa, and the caption reads, “Conrad Riehle–the fifth settler of Spillville and the first to come with a team of horses and a wagon”. Caroline2 Riehle, born about 1857 in Spillville, Winneshiek County, Iowa; died Unknown. She married John (J.C.) Klein May 14, 1878. Elizabeth Riehle, born about 1859 in Spillville, Winneshiek County, Iowa; died Unknown. She married John Dvorak. Anthony Riehle, born about 1861 in Spillville, Winneshiek County, Iowa; died 1940 in Iowa. Frank Riehle, born May 13, 1863 in Spillville, Winneshiek County, Iowa; died October 23, 1893 in Spillville, Winneshiek County, Iowa. Mary Anna Riehle, born July 29, 1865 in Spillville, Winneshiek County, Iowa; died Unknown. She married James Beranek. Joseph Francis Riehle, born July 05, 1867 in Spillville, Winneshiek County, Iowa; died January 16, 1944 in Iowa. Rosa Riehle, born about 1869 in Spillville, Winneshiek County, Iowa; died September 17, 1944. Henry Riehle, born July 28, 1871 in Spillville, Winneshiek County, Iowa; died July 1939 in Iowa. Anna Riehle, born August 06, 1873 in Spillville, Winneshiek County, Iowa; died Unknown. She married Fred Sestak. George Riehle, born February 25, 1876 in Iowa; died 1963 in Iowa. William Riehle, born February 03, 1878 in Winneshiek County, Iowa; died June 22, 1964 in Iowa. Anthony2 Riehle (Conrad1) was born about 1861 in Spillville, Winneshiek County, Iowa, and died 1940 in Iowa. He married Harriet Theresa Heldt November 20, 1883. She was born 1858 in Spillville, Winneshiek County, Iowa, and died 1941 in Iowa. Rose Emma3 Riehle. Married Carl Edward Herold,born about 1885. Frank2 Riehle (Conrad1) was born May 13, 1863 in Spillville, Winneshiek County, Iowa, and died October 23, 1893 in Spillville, Winneshiek County, Iowa. He married Rose Caroline Heldt June 24, 1884. She was born August 24, 1860 in Winneshiek County, Iowa, and died March 06, 1949 in Cresco, Howard County, Iowa. 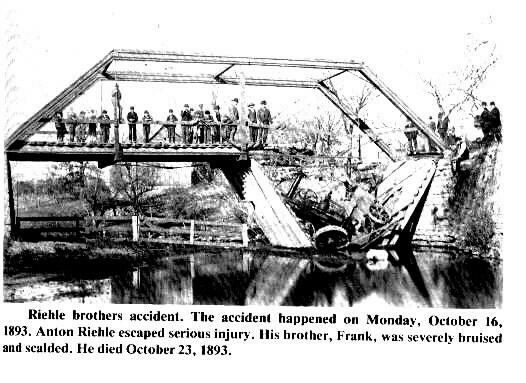 After husband, Frank, was killed in the accident on the bridge, daughter Rosena was born 18 May 1894 and died 5 March 1900. Rosena was a red-haired girl whose hair hung down to her waist. Grandma Rose was very frugal. She saved her seed, started it sprouting, and planted that seed for the family garden. She spent most of her time hoeing. She was stalwart, walked straight, and was very independent. My father, Fred Riehle, would buy whiskey for his mother (Rose) and she would hide it. She made her own clothes and she particularly liked polka dots. Her expression was, “Is that right.” Evidently, she had things her own way on the farm. One had to butcher the right way and she had her own way for smokehouse seasoning. I (Dorothy Riehle Call) remember visiting the farm, and my greatest recollection is the black walnut tree. One had to use an anvil and hammer to pound on the walnut, which had an outer fuzzy green covering. I also recall the Indian graves that had been plowed around and it was easy to see. Grandma Rose was aptly named as she had flaming red hair. Even in old age, her hair dulled down but was never gray. Grandma Rose moved to town with Uncle Joe and Aunt Carrie after renting the farm. She wove rugs to supplement her income. During WWII she was active in the Red Cross and was awarded a Red Cross pin. George Anthony Riehle, born July 05, 1887 in Spillville, Winneshiek County, Iowa; died April 09, 1963 in Iowa. He married Mathilda Ptacek June 03, 1913; born January 02, 1889; died June 29, 1971. Francis J. Herold and Caroline Riehle Harold were the Godparents of Dorothy Riehle Call. Frank W. Riehle, born December 28, 1889 in Winneshiek County, Iowa. He married Sophia Neubauer. Frederick Henry Riehle, born February 18, 1893 in Spillville, Winneshiek Co., Iowa; died April 08, 1988 in Scottsdale, Arizona. He married (1) Gertrude Regina Eleanor Steinmetz October 07, 1913 in St. Joseph’s Church, Cresco, Iowa; born September 18, 1895 in Cresco, Howard Co., Iowa; divorced in 1950; died May 14, 1982 in Cresco, Howard Co., Iowa. He married (2) Muriel Luers August 21, 1951. Elmer3 Riehle, born about 1897. Clarence Riehle, born about 1902. Aloysius Riehle, born about 1904. Louise Riehle, born about 1904. Rosa2 Riehle (Conrad1) was born about 1869 in Spillville, Winneshiek County, Iowa, and died September 17, 1944. She married. She married Joseph Slebiska February 03, 1891. Only child of Rosa Riehle and Joseph Slepicka is Gertrude3 Slepicka, born 1894 in Iowa. She married William M. Herold; born 1890 in Iowa. Henrietta3 Riehle, born January 29, 1900; died January 20, 1982. She married Bert Schissel. Wilfrid George Riehle, born July 16, 1906 in Ft. Atkinson, Iowa; died June 09, 1966 in Milwaukee, Wisconsin. He married Marie Mercedes McKenna February 10, 1936 in St. Bridget’s Church, Bluffton, Iowa; born April 03, 1917 in Decorah, Winneshiek County, Iowa. George2 Riehle (Conrad1) was born February 25, 1876 in Iowa, and died 1963 in Iowa. He married Frances B. Herold June 27, 1899. She was born July 04, 187719, and died 194519. Gertrude3 Riehle, born November 15, 190219; died December 09, 1996. Irene Riehle, born May 04, 190819. Leo Riehle, born November 15, 191019; died July 195719. Leona Riehle, born November 15, 191019; died September 14, 198919. Paul Riehle, born 191319; died 196619. Viola Riehle, born May 05, 191519; died August 08, 198519. Bernard Riehle, born December 13, 191719. William2 Riehle (Conrad1) was born February 03, 1878 in Winneshiek County, Iowa, and died June 22, 1964 in Iowa. He married Christina SoukupJuly 06, 1904 in St. Wenceslaus Church, Spillville, Winneshiek Co., Iowa. She was born April 23, 1885 in Ft. Atkinson, Iowa, and died June 12, 1981 in Decorah, Winneshiek County, Iowa. Mae3 Riehle. She married Adolph Mashek. Oscar Riehle, died at age 1. Norbert Riehle. He married Angline Sabeika. Christine Riehle. She married Ray Lukes. Wilma Riehle. She married Ervin Sabelka. Dorothy Riehle. She married Russell Hanson. Julius Robert Riehle, born December 01, 1923 in Winneshiek County, Iowa. He married Phyllis Marie Novak; born September 12, 1936. 1. Wagshurst Baden Catholic Church record #44 of births listed in 1828. 2. Winneshiek County Courthouse, Decorah, Iowa. 3. Tombstone inscription St. Clement’s Cemetery, Winneshiek Co., Iowa. 4. Records of marriage found in Festina, Iowa, Citation 17, marriage of Conrad Riely (Riehle) and Anna Jarush (Jarosh). Witnesses John and Anna Kremish. Signed by Priest Louis DeCaily. 5. State of Iowa–Department of Vital Statistics, Death Certificate, Lists date of birth as March 11, 1837, born in Bohemia. 6. Winneshiek Co., IA, marriage record – Second marriage of Anna (Jaros) Reahli to Vencl Slepika on July 28,1882. Lists her birthplace as Tabor, Bohemia. 7. State of Iowa–Department of Vital Statistics, Death Certificate. 8. Tombstone inscription St. Clement’s Cemetery, Winneshiek Co., Iowa. 9. 1850 Federal Census, Winneshiek County, Washington Township. 10. 1860 Federal Census, Page 106, Calmar Township, Winneshiek Co., Iowa. 11. 1870 Federal Census, Page 46, Calmar Township, Winneshiek Co., Iowa. 12. 1880 Federal Census, page 15, Ed. 340, Calmar Township, Winneshiek County, Iowa. 13. Tombstone inscription St. Clement’s Cemetery, Winneshiek Co., Iowa. 14. Obituary, Page 4, col. 1 and col. 2, Calmar Courier, April 10, 1914. 15. Obituary, page 4, col. 1 and col. 2, Calmar Courier April 10, 1914. 16. Obituary, Page 4, col. 1 and col. 2, Calmar Courier. April 10, 1914. 17. Notes of Dorothy Riehle Call. 18. Iowa Sesquicentennial Project of the Decorah Genealogy Association, WINNESHIEK COUNTY, IOWA BIOGRAPHIES – 1996, (1996; Decorah, Iowa), page H-72, Submitted by Helen Langreck. 20. Iowa Sesquicentennial Project of the Decorah Genealogy Association, WINNESHIEK COUNTY, IOWA BIOGRAPHIES – 1996, (1996; Decorah, Iowa), pages, K-58 – K59, Article submitted by Alice Kuhn.